Port of San Diego christens updated boating venue, which finally opens after a prolonged construction period. SAN DIEGO—The Shelter Island Boat Launch Ramp is officially back in business, as the Port of San Diego officially dedicated the busy boating venue on Jan. 22, in front of local community members and local boaters. Garry Bonelli, the Port of San Diego Board of Port Commissioners chair, led the ribbon-cutting ceremony. The 10-lane boat launch ramp has been under construction for more than a year, as the port district executed a much-needed redevelopment of one of the nation’s busiest boating venues. Nearly 50,000 boaters, annually, use the boat launch ramp at Shelter Island. Upgrades to the boat launch ramp include an enlarged maneuvering area, longer boarding floats, new signage and lighting, and a public walking platform. Port district officials began the boat launch ramp development project in November 2015, when the regional agency was awarded a $6.1 million grant by the Division of Boating and Waterways. 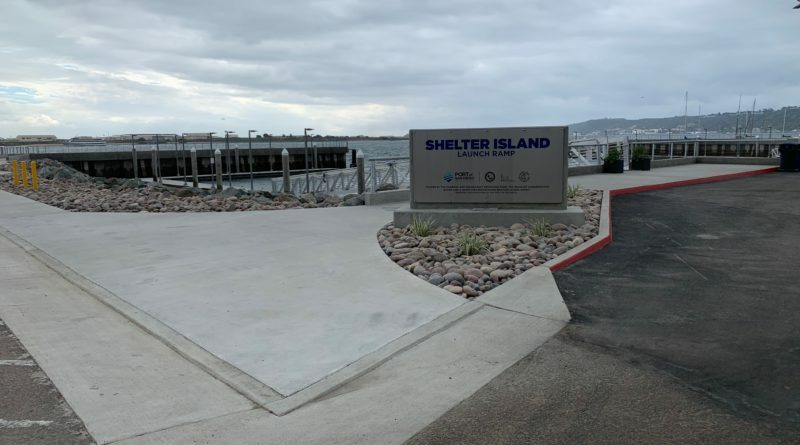 The port district received another $3.5 million in grant funding by the California Wildlife Conservation Board, giving the redevelopment project a total budget of $9.6 million. “The funding allowed the port to move forward with the project, which completely demolished the former Shelter Island Boat Launch Facility and replaced it with a larger, more modern and safer facility,” port district staff said in a released statement about the boat launch ramp dedication and ribbon-cutting. Work on the boat launch ramp began during in mid-2017; port district staff planned to have the venue re-opened to the boating public by March 2018, just ahead of the start of last year’s boating season. Nine of the 10 launch ramp lanes were initially shut down; the tenth lane was finally offline by September 2017. Logistical delays caused the project to continue for several more months. The boat launch ramp was finally re-opened on Dec. 21, 2018, with the grand re-opening taking place one month later. Bonelli positioned the updated boat launch ramp as safer and more efficient. An updated boat launch ramp also serves as the symbolic start of the port district’s larger plans to revitalize the entirety of San Diego Bay. Also speaking at the ribbon-cutting ceremony were Port of San Diego CEO Randa Coniglio, California Boating and Waterways Commission member Douglas Metz and California Wildlife Conservation Board Executive Director John Donnelly. Triton Engineering designed and R.E. Staite Engineering constructed the new boat launch ramp. Port district staff stated the boat launch ramp renovation was delivered within budget.